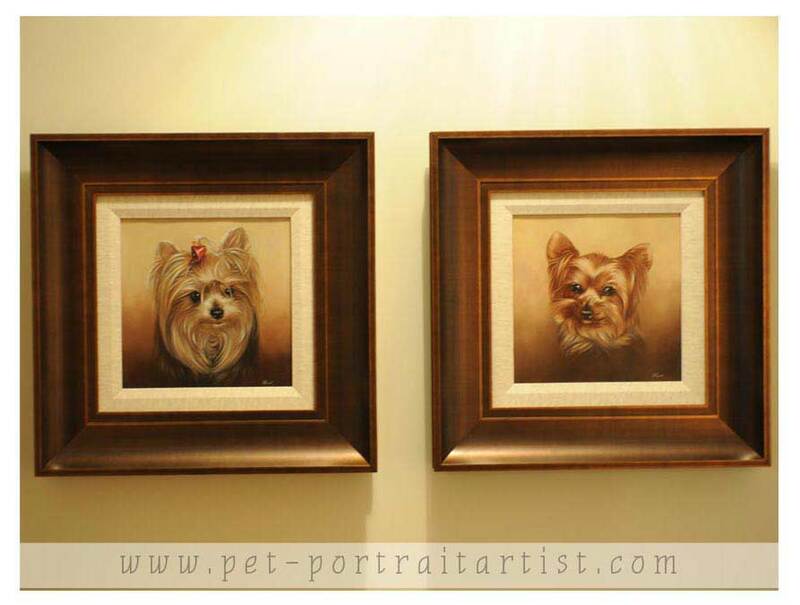 Bill contacted us in 2011 to ask if we would be able to paint their two dearly departed and very much missed Yorkshire Terriers Brandy and Gibson. Bill and Sandra gathered some photos of Brandy and Gibson on disc and sent them across the pond for us to view. There were two photos in particular that we felt would make for lovely portraits and after a few emails to confirm with the clients, Nicholas sent about the task of portraying them on two separate 10 x 10 canvases. Bill has very kindly sent us a wonderful photo of the portraits hanging in situ - isn't the lighting spectacular for them. I have also added some feedback from Bill and Sandra below too. Thank you for taking the photo and allowing us to share it with everyone here on our website! Attached are two photos of our puppies that you and Nicholas memorialized. You may find these suitable to be placed on your website. Sandra and I are still wrestling with the idea of taking some pictures of these beautiful oils with ourselves included in the photos, and when we do, I will forward those to you as well. I believe Jason (our framer) did an excellent job, and if you could view these portraits as they are displayed in our home, you would be able to see that the colors in the frame are identical to the colors in the coat of Gibson. We picked up our portraits from the framers yesterday, and couldn’t be more pleased. Jason, the shop’s owner, was so impressed with the detail in Nick’s paintings that he looked you up on the web and was further impressed with the display of other commissions that the both of you had done. 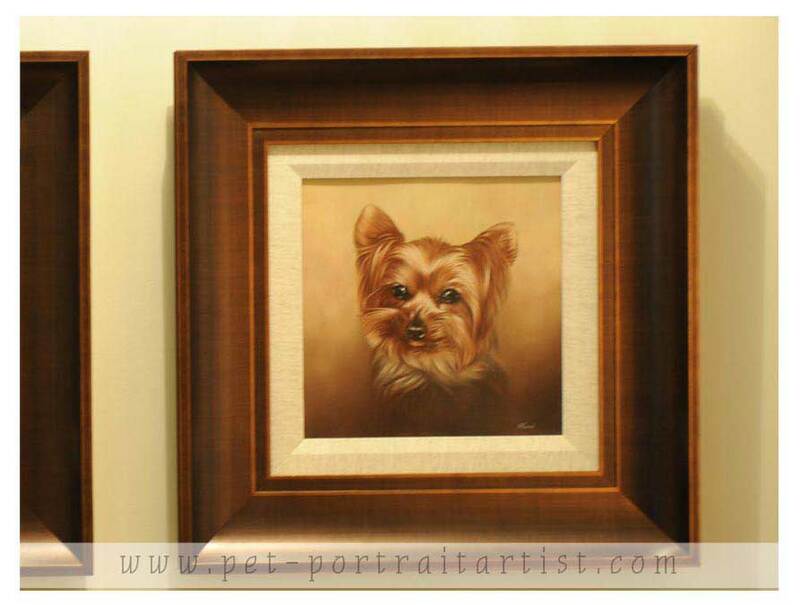 At some point, another customer happened to see the portraits of our puppies and was taken by the quality as well. Jason immediately referred them to your website and was telling them of the overflow of talent displayed by the both of you, and was quick to recommend you as a source for a portrait. This is just a further indication as to the impact these paintings are having on folks who see them. We are extremely proud of the end results, and feel very fortunate to have found you through Sandra’s research efforts. We made certain that Nicholas’s signature would be clearly displayed as part of the framing process. 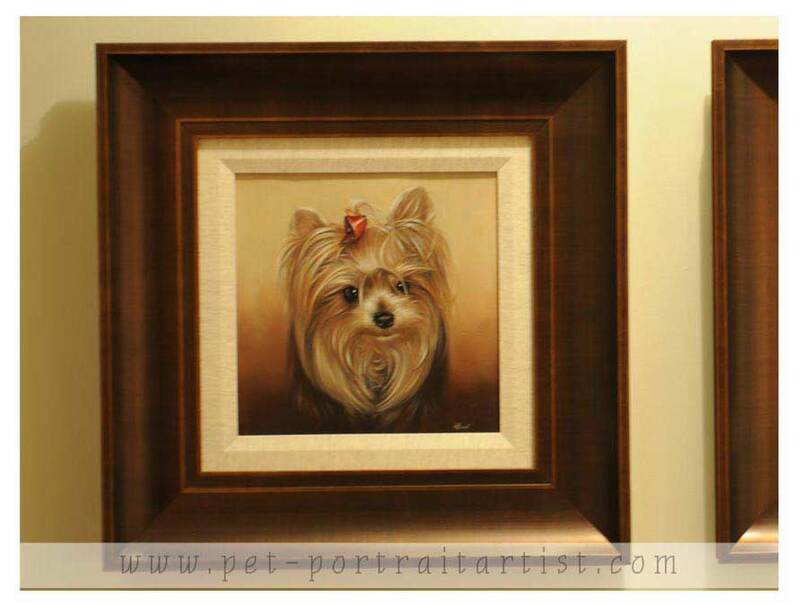 Thanks again for helping to bring some closure to the loss of our furry friends, and while both Brandy and Gibson will be sorely missed, the spirit of both puppies will forever be in the portraits Nick has painted. They will also stand as a visual reminder of the warmth and happiness these little creatures brought to the Sills’ household while they were among us. Thanks again. Now, stay tuned for pictures. Are we pleased? Indeed we are!!! Now we are about the framing and preparation for displaying them in our home. I believe I mentioned that Sandra had cleared a wall where she intends to display the paintings, and added a fresh coat of paint to the surface last week. 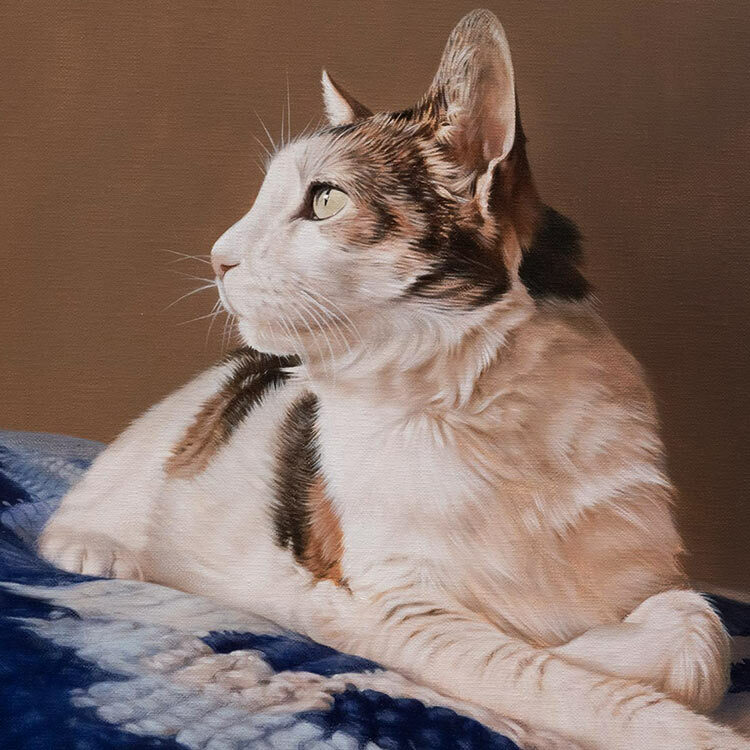 Melanie, I want to offer my sincere thanks to you and Nicholas for sharing your talent with us and in capturing the spirit of our fuzzy friends. 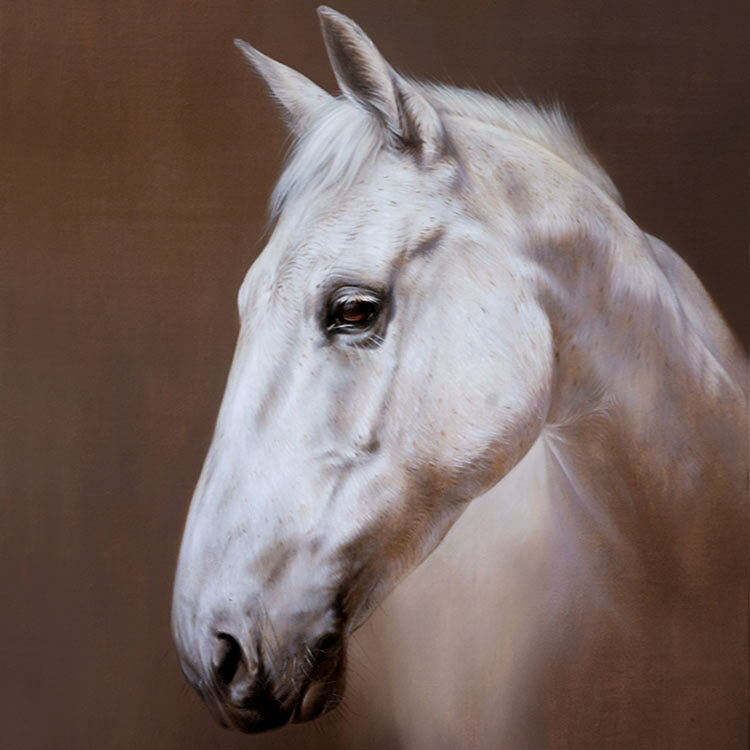 We will enjoy these paintings for the remainder of our lives and will think of you each time we view them. There is already talk in the Sills household about the possibility of asking you to memorialize the two new arrivals before the sadness of their departure is upon us. We intend to take many photographs over the next year in an effort to get just the right pose and expression that we can share with you. I wish to thank you and Nicholas sincerely for giving us yet another memory of our little loved ones that will be enjoyed forever.